Saveable templates and multiple themes ensure that you can develop your interface faster than ever. The Ribbon is a region at the top of the screen that replaces traditional menus, toolbars, and task panes with a simpler system of interfaces. Ribbon for WinForms doesn't stop there. It includes three controls that make up a consistent-looking application container. Ribbon is the main Ribbon control which includes the application menu, Quick Access Toolbar (QAT) as well as the customizable tabs and groups used to display related commands. StatusBar is a Ribbon-styled status strip control docked to the bottom of the form. RibbonForm is a class that provides a Ribbon-styled Windows Form containing a title bar and a client region. Ribbon features extensive design-time support, including ComponentOne SmartDesigner® technology. Activate the context-sensitive floating toolbars with one mouse click, and make changes right on the design surface. This no-code design experience provides hassle-free customization of the Quick Access Toolbar (QAT), tabs, groups, and other interface elements. 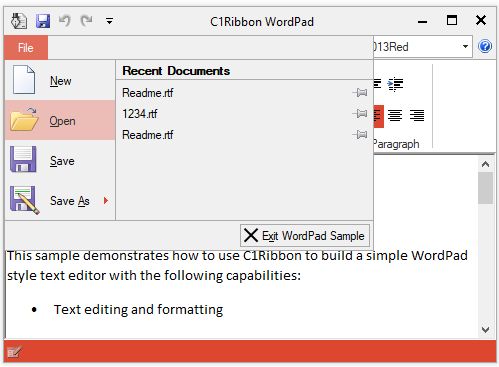 Ribbon for WinForms also provides SmartTags, collection editors, and more. 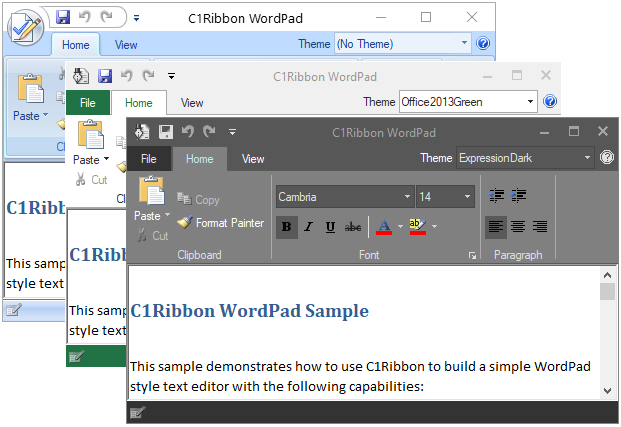 Ribbon UI elements achieve a look that is pixel-perfect with the Microsoft Office interface and includes Office and Windows-based themes. Ribbon supports any third party WinForms control. You can incorporate arbitrary controls in the Ribbon by using the RibbonControlHost element. 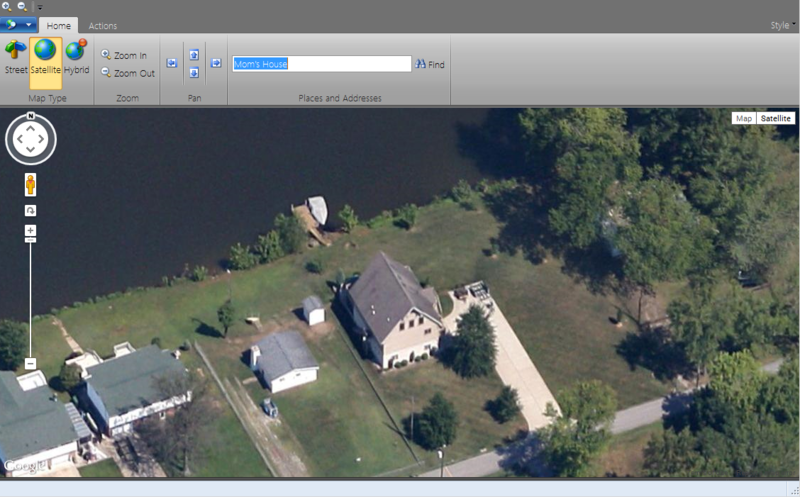 For example, a map is hosted in the Ribbon container in the screenshot below this text. Using ComponentOne SmartDesigner® technology, you can quickly change the Application button's image and customize the Application menu. For example, display menu items as images, text, or both. The Application menu can display as the original, round button look introduced in Office 2007 or the newer Windows 7+ look.